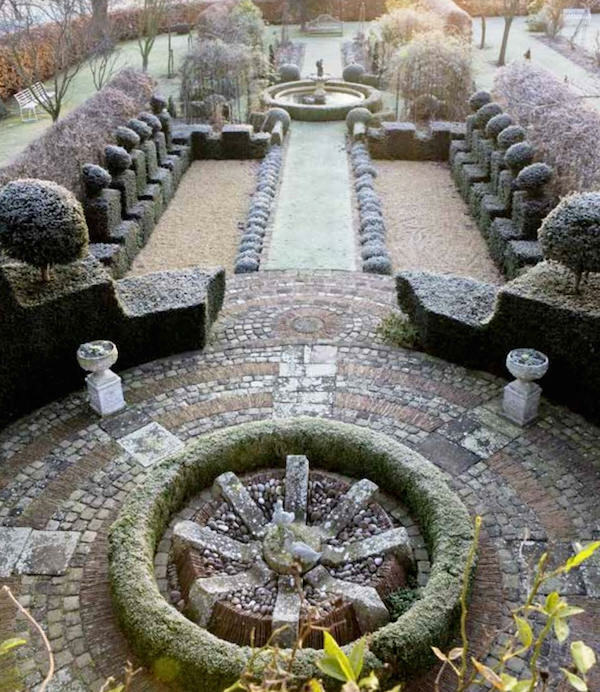 Anyone who has perused the pages of books or magazines or even Pinterest boards that feature beautiful gardens, is familiar with the name of Clive Nichols. One of the world’s finest and most famous flower and garden photographers, he has traveled the world photographing gardens that include the HRH The Prince of Wale’s own private garden in Scotland and Lord Rothschild’s in Corfu. 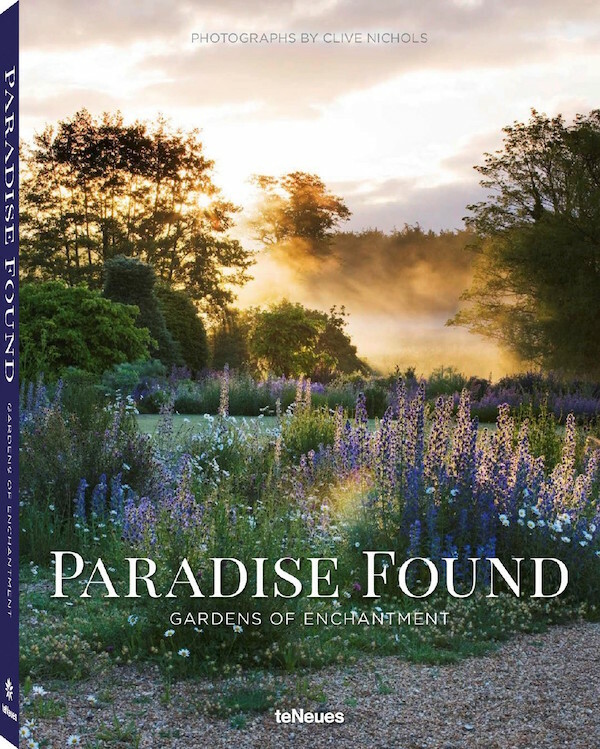 In his latest book, Paradise Found: Gardens of Enchantment, he leads us through a selection of nineteen stunning properties, primarily in England with two in France and one in Italy. 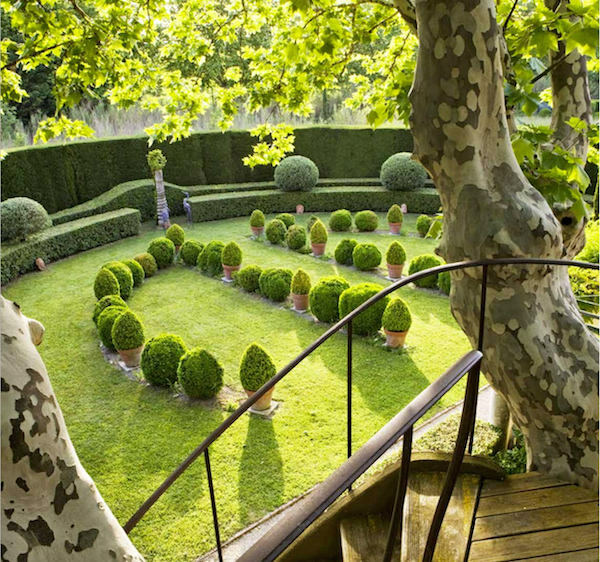 Above, the formal garden of the twenty acres at Les Confines in Provence, designed by celebrated landscape gardener Dominique Lafourcade. Here potted and planted topiaries blend with the sinuous sculpted hedges and landscape. 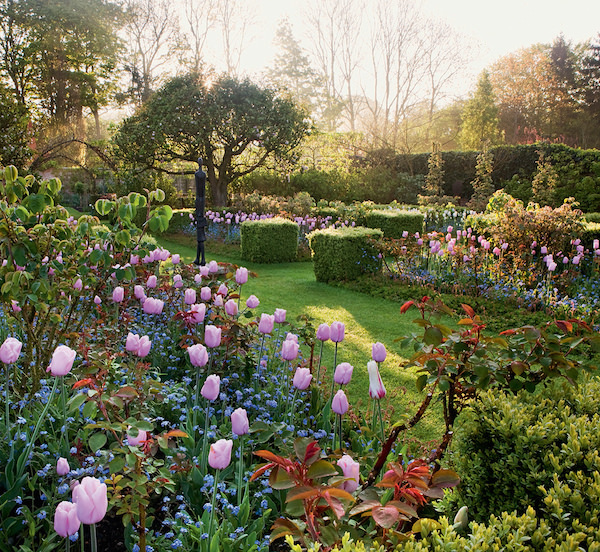 Pashley Manor, in East Sussex, above, is considered one of the finest gardens in England. While a private family home, the gardens are open to visitors most days April to September, where there is a splendid assortment of thousands of tulips and over a hundred varieties of roses. While Cliveden House is leased out as a luxury country house hotel, as part of its arrangment with the National Trust, guided tours are available of both house and garden. 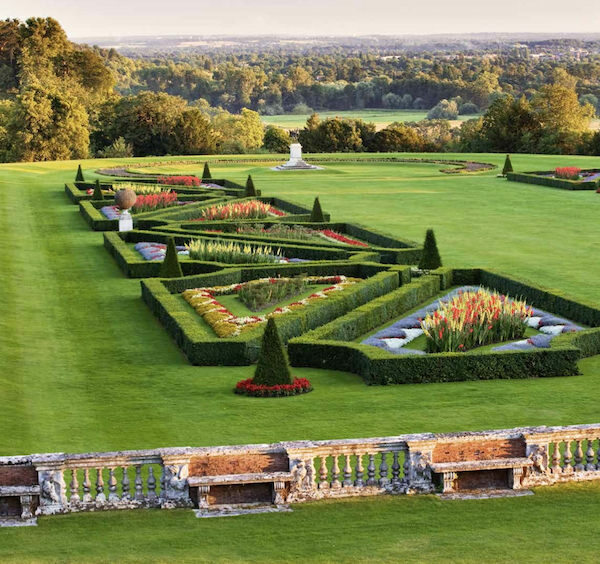 Since 2010 the Trust has been working to “recapture the glory of Cliveden’s pièce de résistance – the Parterre,” above. The six acres features in spring 11,050 bulbs and 20,350 plants, all of which are removed and then replanted for summer with 30,950 more plants. The Parterre also includes over 2.5 miles of hidges and 18 topiary pyramids. 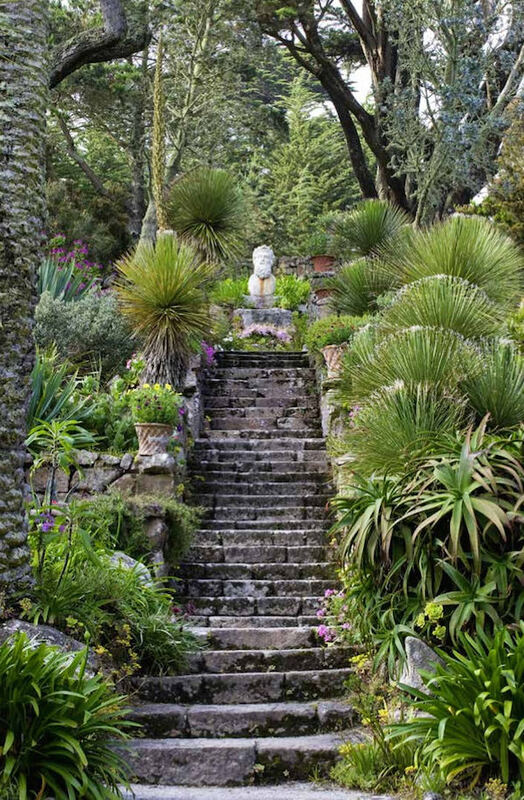 The 17 acre Tresco Abbey Gardens in the Isles of Scilly, above, were established in the 19th century by Augustus Smith. The famous sub-tropical garden is home a variety of exotic plants, including more than 20,000 species from 80 countries. Frost is a rare occurrence and many of these plants are usually seen only from within a conservatory. While the Manor House in Bedford, England is only 4.5 acres, it has many different areas of interest. Designed and cared for by owners Simon and Kathy Brown, it offers a wealth of beauty even in winter. If you are captivated by the images in the book, Clive regularly gives master classes in flower and garden photography for The Royal Horicultural Society. This entry posted in books, garden. Entry Tags: Clive Nichols, Garden Books, Gardens, Photography Bookmark the permalink. Let’s do a tour of them . Could be amazing trip ! Like Ellen Fisch quoted from Cicero. I often use that quote. A tour of those gardens would be heavenly. That book may find a place with me by the fire this coming winter. His work is simply stunning. They are gardens I could get lost in forever! I just fall in love with his work! The photos are gorgeous! I live in Santa Barbara where paradise is found around every corner. Have you been here? If not take a trip here. Your always welcome here. Lately, I have been finding beauty in the Midwest landscapes. the rolling hills are a thing of wonder as well. 80 queries in 0.737 seconds.